I have glazed hams several ways over the years. The very best so far was when I bought a “raw ham” from the butcher which I then cooked at a very low temperature for about 8 hours on the day before and then finished off with a glaze at a moderate temperature for around 40 to 45 minutes – ie enough time to colour the glaze and warm the ham right through again. If you were glazing at the end of the 8 hours you wouldn’t need anywhere near as long for the glaze – say 20 minutes. But the 8 hour thing was a real mission on a hot day. So I will stick with a cooked ham this year. You could add a little ginger and/or chilli to almost all of these to add some extra kick. Don’t worry too much about the relative quantities. Glazing is pretty forgiving. You do need about a cup and a half of glaze or more to ensure you can keep basting over the ham every 5 to 10 minutes during the glazing process. I do stud the ham with cloves. And I think it is a good idea to buy new cloves every year rather than using the old musty ones from the year before. I put them either in the intersections between the diamonds of fat you have scored or in the middle of the diamonds – it doesn’t seem to make much difference. One year I did the scoring too deeply and squares fell off which wasn’t so good. So a light scoring is best. Don’t forget to take the skin off before you start. Leave a nice layer of fat because this is what holds the glaze and makes it taste great. 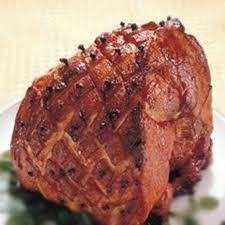 Even if you don’t eat fat the rest of the year, a tiny bit with a Christmas ham will be a treat. Yum, ham! Thanks for all the cool glazing ideas. The honey mustard is pretty classic, and I like the idea of marmalade or cranberry sauce. I don't think I've ever dealt with a raw ham. I love ham but I've only gotten it pre-cooked and glazed. I love your different flavor profiles - especially the brown sugar, orange juice, dijon mustard and honey. My mouth is watering just thinking about it! I've been looking at recipes for cooking a ham in my Crock Pot. Good idea about getting rid of old spices. In fact, I'm tackling and reorganizing my spice cabinet today, so it's a very timely reminder for me to be ruthless! Thanks for the reminder, I did one 2 years ago and it was fantastic and I'm not a big fan of ham. Might put it on the menu this Christmas.